I’m gonna do something here I don’t normally do. I”m gonna overwhelm you with FO’s! 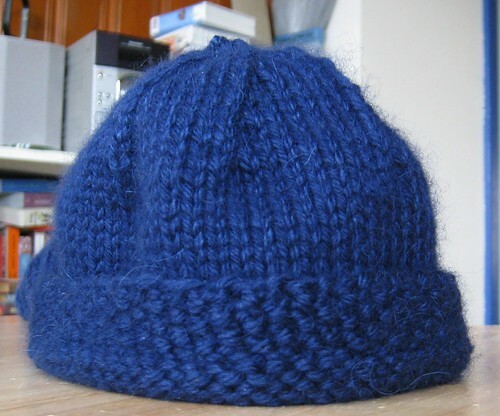 I really think each and every finished knit deserves it’s very own post. 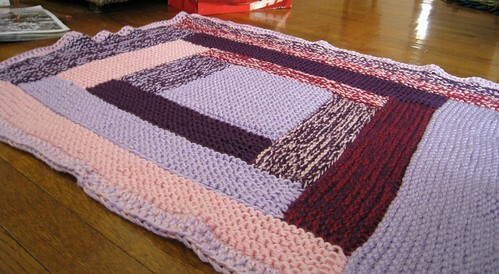 But I have several 2007 Finished Knits that I want to get out there so I can start 2008 off fresh and new. 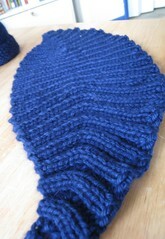 Next up – Baby Hat in the same Panache, it’s a matching set for Mom and Baby see? I think I cast on 64 stitches, worked in seed stitch for awhile then switched to stockinette and started the decreases when it seems appropriate. 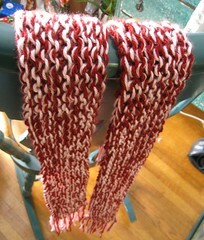 Matching scarves for my niece in Carons’ Simply Soft. I was snowed in at my Parents and I had the yarn, so I cranked out a couple of sideways scarves to go with their blankets. Here is Ashely rocking hers. Doesn’t she look all artsy with the scarf and the markers? She just needs a beret!